MTG Studio • View topic - "Undo" feature. Can we get an undo feature possibly? Dont know how hard that would be based on how you coded everything but it would be nice for those woops I cant remember what my focus was on last when I hit delete lol moments. Done that a couple times but was in really small collections. Hopeing I can fix that behaviour in myself before it gets the worst of me with something important lol. I'll go make it a request on the feedback but figured I would ask here too just to be complete. I just deleted something and I have no idea what it was. Was surprised there wasn't an undo feature when I tried Ctrl+Z. To my surprise as well there have been only 3 requests so far for Undo feature for the past 8 years. If you insist on this I can research what can be done about it. Btw, if you delete something by chance you can kill MTG Studio from Task Manager since it saves changes only at exit. Kind of knew that about the saving on exit but didnt think to use it as a undo trick. Good to know. Thanks. 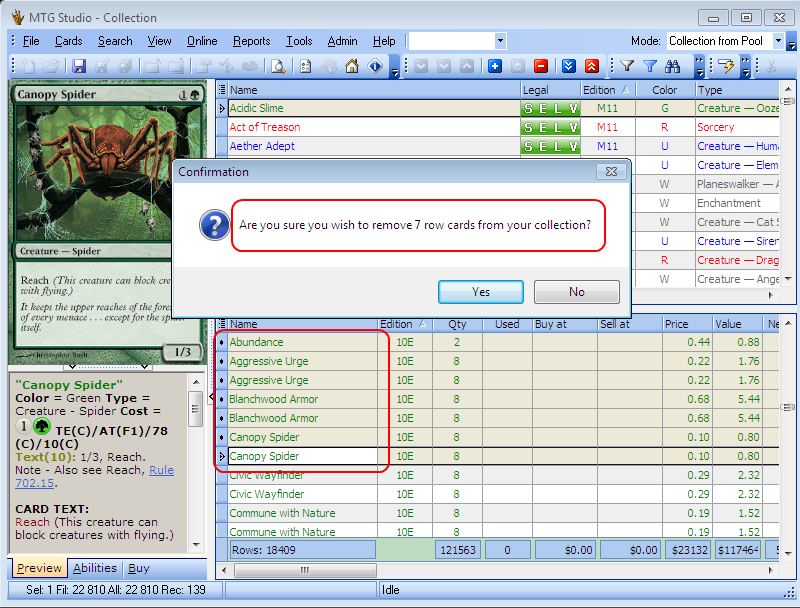 MTG Studio 1.8.1 will have the confirmation prompt when deleting more than one selected card from collection. I know this is not the Undo feature you have requested but at least can help a bit. Hey works for me. Thanks! Yep, I am aware of the fact. The hosting provider is having again hard time with spam emails and has blocked the email sending for a while. Alrighty. I'll refrain from mentioning it anymore and assume thats what it is from now on. Schwanke wrote: Alrighty. I'll refrain from mentioning it anymore and assume thats what it is from now on. Thank you for your post. It should be fixed now...and do not hesitate to report such obstacles. This forum is made for sharing MTG Studio related stuff + forum problems itself. Ahh no worries. Was just thinkin no sense in posting every other day its busted if you know its busted and its going to stay busted until they stop the spam problems. Yeah. I'll report it again. No worries. It would also be nice if there was a "are you sure" message when deleting any cards from your collection. Not just more than 1 row. I'm sure I'm not the only one that has accidentally deleted a card and don't even know which card in order to fix it. I was thinking that too but didnt wanna be rude and ask for it after he just put it in so quick for more then one. I think ideally it should be the classic "Do you wish to delete these number of records: x" and then have a check box "dont show this dialog next time" and then an option in the configuration pages to turn it back on. 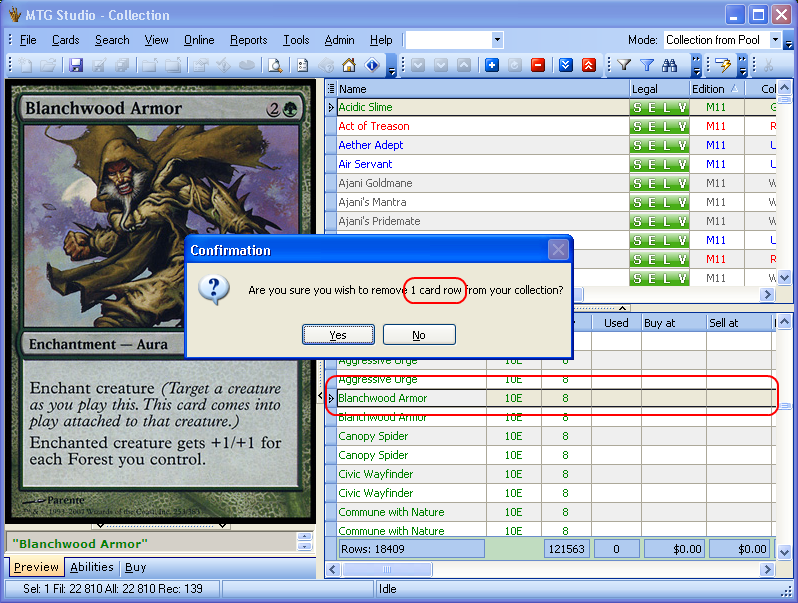 powerslave wrote: It would also be nice if there was a "are you sure" message when deleting any cards from your collection. Not just more than 1 row. I'm sure I'm not the only one that has accidentally deleted a card and don't even know which card in order to fix it. Consider it done. Deletion will always prompt you.